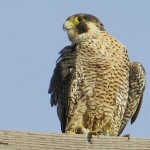 Jill Homcy was recently on Valley Brook Avenue when she recognized a familar Peregrine. 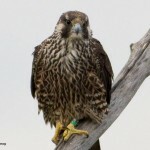 Jill explains: “Last October I stopped at River Barge Park in Carlstadt and found a beautiful banded peregrine falcon fledgling in a tree. I sent pics in to the national banding site, and they helped identify her as having been born in New York City and banded on June 5, 2014. 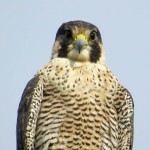 Jill’s first shot is of the fledgling peregrie last October. The next two pics are from Aug. 18, 2015.